Lose Weight: For those who demand for slimming down, cycling is the ideal resolution. 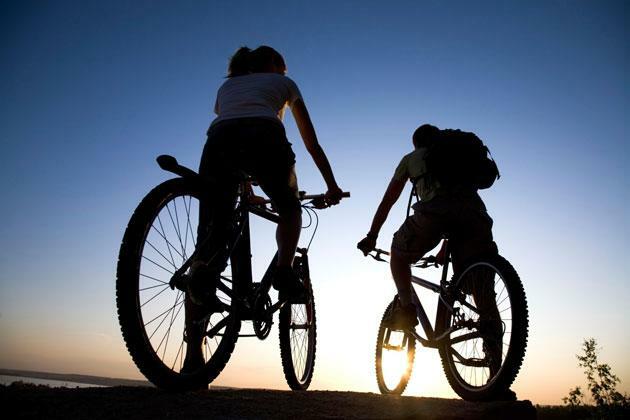 Riding a bike means you exercise, and of course, exercise burn off your calories and fat. Moreover, the metabolic rate in your body increases not only during a ride, but for several hours afterwards. The increasing of calories you burn off has a great impact on the frequency of refueling, so as the sleeping quality is improved. Sport physiologists suggest that cyclists who ride faster and longer distances lose three times more fat than those who cycle constantly but at a slower pace. Enhance Your Heart: Cycling improves your heart health effectively by reducing the heart rate, so your heart beats less frequently and less stressed toward intense conditions. Blood pressure, which controls blood circulation in our arteries, is also lowered due to the ejection of large blood volume flows into each contraction. Better Lung And Breathing Capacity: As you may know, sports and physical activity promote muscle performance. An adult cycling generally require 10 times the oxygen they’d need to watch television for the same period. Prevent Diabetes: Physical activities offer many benefits for diabetics. What causes diabetes is the excess of sugar in the blood. When we exercise or do sports, glucose is consumed for the muscle building, resulting in decreasing levels of blood sugar. When the human body suffers from diabetes, insulin no longer functions correctly, leading to an increase in blood sugar. Sports, therefore, deliver a better natural regulation of the blood sugar level. Cycling on an exercise bike also does wonder for insulin as well, since this hormone plays an important role in balancing blood glucose levels. Gain Muscle And Fit Your Body: Endurance sports including cycling are perfect for toning your legs and arms, along with buttstocks and back muscles. To be clear, your muscles are built in the following body parts: the glutes, hamstrings (below the buttocks), calves (thigh’s backside position) and quadriceps (thigh’s upside position). Promote Better Sleep Quality: Ride a bike for a good night’s sleep. Why not? It has been proven from researchers that cycling enhances your sleeping quality just by tiring yourself out. Though a 20-30 minute early morning ride is not your preferred interest, it will help you get back to your pillow faster by night. Improve Mental Well-Being: A study showed that people who had a physically active lifestyle seem to have better state of wellbeing than inactive individuals. When you exercise, your body releases hormones especially endorphins, adrenalin and serotonin, which will regulate mood swings, counter stress and depression. Reduce Premature Aging: Not only cycling, almost gentle exercises help tighten your skin and reduce the signs of aging. An intense exercise circulation is an element to provide oxygen and nutrients to skin cells in a natural way, while excluding toxins and free radicals out from the body. It also a good base within the body to optimize collagen degeneration, reduce wrinkles and speed up the healing process, therefore making you younger and revitalized. Grow Your Social Circle: There is a reason why cycling is considered an incredibly sociable sport. When you are ready to get out of your own room for saddling up, chances are you are going to see many places and people. Even when you are just a solo rider, you are still given opportunities to gather up and interact with others.